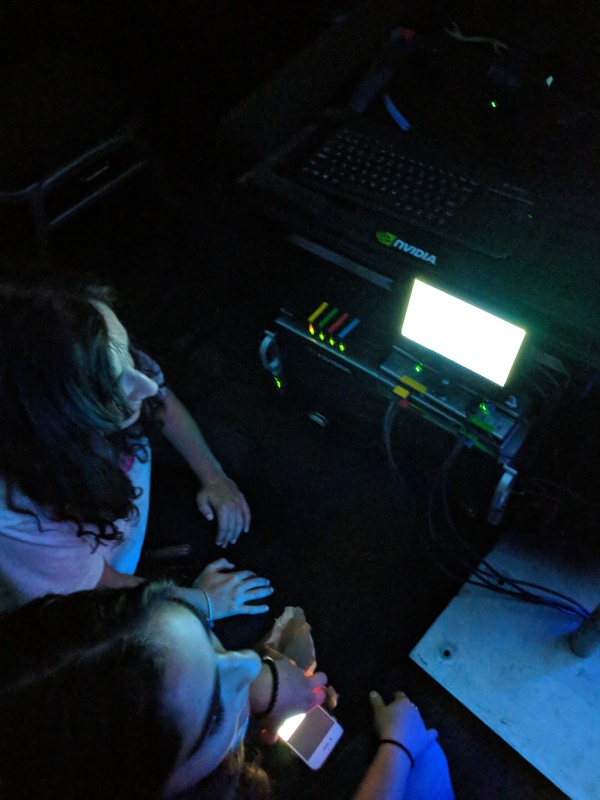 After spending the last week in Vancouver demoing our projects at SIGGRAPH 2018, I am thinking back on the months of work that led up to this event and the vision that inspired us. In this vision, we imagined dancing 3D characters that would be animated in real-time with the ability to respond to user interactions and to change their dance moves on the fly. 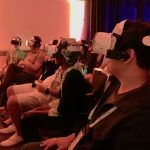 With that vision in mind, we developed two whimsical experiences that we planned to show to SIGGRAPH attendees. 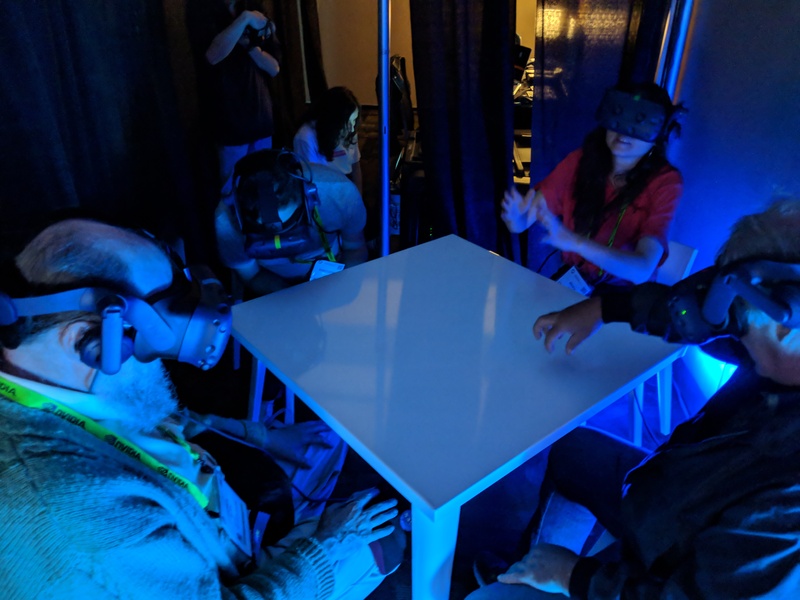 In our first demo, “Mammoth Simulator,” users wore Vive Pro mixed reality headsets and interacted with each other in a shared experience in which mammoths were animated in real-time to walk and dance on the table top in front of them. 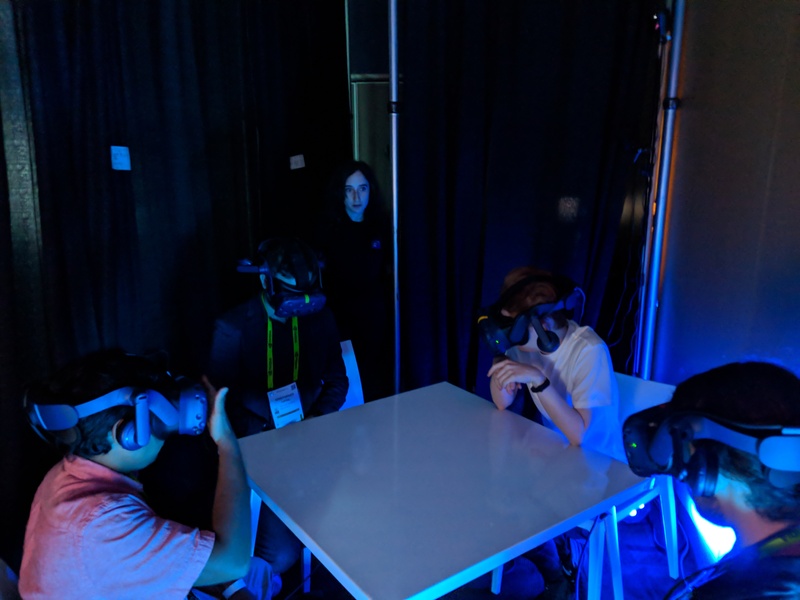 The four Vive Pro headsets were powered by the NVIDIA MU-VR rig. The users were able to drag Rick’s hands down to the ground, altering his dance moves, and making him twerk. All of the animations were created in real-time using the AutoToon motion-synthesis server we developed at our spin-off company, Holojam. Preparing for SIGGRAPH was a great push for us to advance our projects from proof-of-concept to minimum viable product. Since this was the first time we were demoing our product publically, I really didn’t know if people would get it. Luckily, things got off to a good start. The very first demo I gave was to a 14-year-old who was sitting next to me on the plane. He noticed my laptop and wanted to geek out about computer graphics. So, I saw my opening to give a demo to a captive audience. He reacted by saying our Rick demo was “fire!” He then gave me a list of suggestions for how to integrate our tech into his favorite apps. He asked about our business model, and I told him we are building an ad network for mobile game developers to monetize and advertise their games with fun 3D animated characters (he approved – he wants better ads). 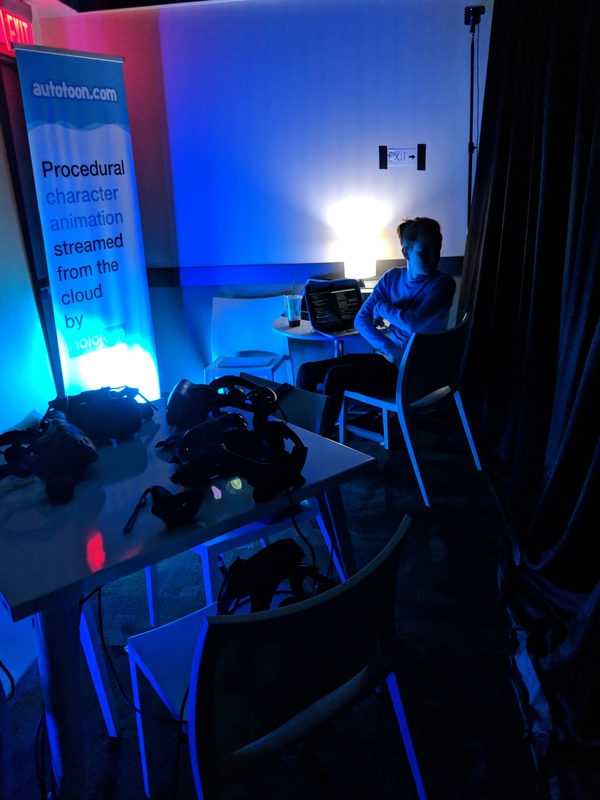 At SIGGRAPH, we set up shop in the VIP lounge of our lab’s mixed reality installation, “CAVE.” There, we gave small group demos to the industry veterans who visited our installation. From the expressions on their faces, the silliness that we created brought out the 14-year-olds in them as well. 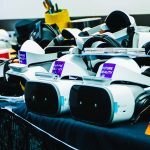 Through the course of the week, our team spent about 50 hours inside of this room, gave around 60 demos to 200 people, and got amazing feedback from the leaders in computer graphics. We see a great life after SIGGRAPH for our project. Hands up to the Holojam team: Ken, Aaron, Alex, and Dan, and a big thank you to our production team for making this possible. Tom from NVIDIA, Mia, Susan, Marcus, Eric, and all of the volunteers – You guys rock!